Christmas lights are one of the most beloved traditions of the holiday season, capable of bringing joy to people of all ages. Once the decorations start going up outside, everyone knows that the holidays are approaching. So, in a way, these decorations are a way to get everyone excited and in the festive spirit. And with recent improvements in illumination technology, it’s easier than ever to find powerful fixtures that are beautiful and energy efficient as well. For the family that likes to keep its decorations on all night, the extra efficiency can be a real treat. How can a family decorate their home with Christmas lights? A family is only limited by their creativity when it comes to setting up decorations. Lights can be placed along walkways, wrapped around trees, attached to the edges of the home, webbed over bushes, and used to spell out words or create unique designs. Some people even set up complex kinetic designs that involve bulbs dancing along with Christmas music. They can be paired with other decorations, like wreaths and garlands, to improve the effect even more. They can also be used to illuminate other displays, like nativity scenes or signs. Modern holiday lights are extremely versatile and can be strung out to incredible lengths, so they can effectively fill up a property of any size. And they are also a beautiful addition inside the home, where they can create a soft wash of illumination around staircases or in a den. A popular decorative option is to wrap pre-lit garland around staircase banisters, making it easier for the kids to see where they are going when they rush downstairs to open their presents on Christmas morning. What kinds of Christmas lights are used for decorations? 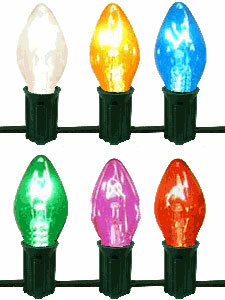 Holiday light technology has improved greatly over the years, and some versions are even made with LED technology. LEDs are prized for their excellent efficiency as they do not use metal filaments to produce illumination. This means more consistent performance and no radiant heat, so you don’t have to worry about a child burning themselves on the fixture. Mini fixtures are the ones people are most familiar with, and they can go anywhere. Mini fixtures are usually available in 50 or 100 piece strands, which will typically extend up to 35 feet. They can be had in any color, including white, red, blue, green, purple, multicolored strands, and more. They are also available in programmable varieties that can be set to emit light in certain patterns. C9 Christmas lights are the larger bulbs that are usually placed around walkways and in yards. C9 fixtures aren’t usually programmable like mini fixtures, but they produce more illumination and are easier to see. They are a perfect contrast next to mini fixtures and offer several visual layers for people to enjoy. No matter what decorations a family uses, though, they can’t go wrong. With so many options out there, a family can get a look that is completely unique and stands out in the neighborhood. What Kind Of Christmas Light Bulbs Are Ideal For Decorating? What Are The 4 Most Popular Types Of String Lights? What Are The Benefits Of Using Battery Operated Candles? Why Are LED Christmas Lights The Top Holiday Illumination Option? How Can Battery Powered Lights Be Used For The Holidays? Where Are The Best Places To Use Party Lights?